What I said: I’m not sure how high they would have had to make this line for me to take the Rams – maybe -20.5. In other games: the Cardinals had a big lead over the Ravens in Baltimore, but failed to hold on and lost by a field goal; the Bills won for the first time in five tries playing in Toronto, keeping the injury plagued Redskins off the scoreboard in a 23-0 win; Tim Tebow had another bad game but without the fourth quarter heroics – the Lions beating the Broncos 45-10, moving Detroit to 6-2 for the season; the Steelers dominated the Patriots, whose secondary could not contain any of Pittsburgh’s receivers in a 25-17 loss for New England; and the Eagles put in the kind of performance that shows why many predicted them as Superbowl favourites before the season, as they beat their divisional rivals, the Dallas Cowboys, 34-7. On Monday night, the Chiefs won their fourth straight game, having lost their first three, and now sit atop the AFC West with the team they beat, the San Diego Chargers. This week sees several good divisional matchups across the league: AFC East contenders the Bills and Jets meet in Buffalo; the Steelers look for revenge for their week 1 loss against the Ravens in Pittsburgh; the New Orleans Saints hope to recover from their shock loss to the Rams, at home to the Buccaneers, who had a bye last week after their trip to London the previous Sunday; and in a battle of the Bad Quarterbacks, Tim Tebow’s Broncos face off with Carson Palmer’s Raiders in Oakland. There is also a rematch of Superbowl 42, when the New York Giants beat the New England Patriots to spoil their perfect season; the Packers will look to continue their unbeaten season when they play the Chargers in San Diego – though Sports Illustrated jinxed Green Bay this week by putting them on their cover with a headline of “The Perfect Pack”; the 6-1 49ers come to the East Coast to play the Washington Redskins; and the Rams try to improve on last week’s surprise win over the Saints when they travel to Arizona to face the Cardinals. 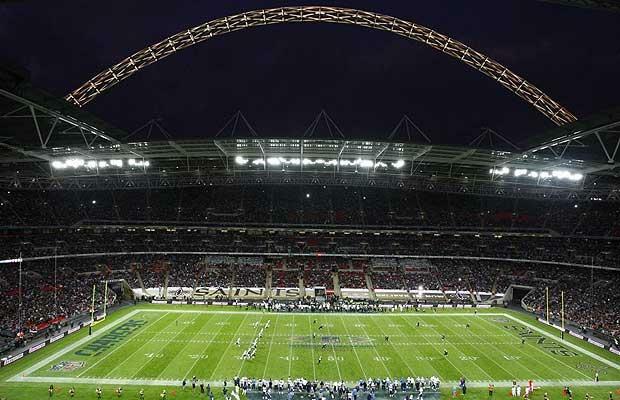 There is a perfect crossover in footballs of both types this week, as the Tampa Bay Buccaneers and Chicago Bears will play the fifth regular season NFL game at Wembley Stadium, the home of English “soccer”. This now annual event is well received by the legion of fans the NFL has attracted across the Atlantic, but there is still disdain on both sides for the other country’s “football” – which results in those who only embrace one of the sports, missing out on the other. To most Brits, American Football is nothing more than ‘rugby with pads”; alongside those in the US who consider soccer boring, due to a lack of scoring. 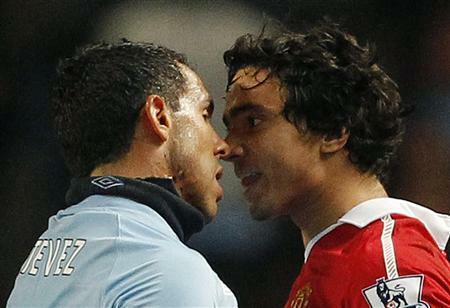 In the Premiership this weekend, one game stands out above all others – Manchester United versus Manchester City – a battle of the top two in the league, who meet on Sunday at Old Trafford. Having won the FA Cup last season, City at least will not have to see the banner boasting of the length of the trophy drought they had been in, which has been hung at their rival’s stadium for many years. After last week’s results (when City beat Villa, while United were held to a draw by Liverpool), Roberto Mancini’s team travel across Manchester knowing that a point would be enough to remain in pole position. There is also a south-west London derby on Sunday, as QPR host third place Chelsea; while in the Midlands, Aston Villa take on West Brom. Arsenal hope to continue their revival at home to Stoke; Norwich go to Anfield to play Liverpool; Newcastle host Wigan and Fulham and Everton meet at Craven Cottage. Tottenham, who are unbeaten in their last five, travel to Blackburn – but have a game against Rubin Kazan (who I think Bob Dylan sang about in “Hurricane“) in the Europa League on Thursday to contend with first. Week 7 of the NFL, as well as having the London game between the Buccaneers and the Bears, includes an NFC North match-up as the Packers play the Vikings in Minnesota; the Titans host the Texans in the AFC South; the Jets meet the Chargers at the Meadowlands; and the Cowboys are home against the St. Louis Rams. There is a rematch of both Superbowl XLIII (Steelers vs Cardinals) and Superbowl XLIV (Colts vs Saints) – though both sides look very one-sided now – with the teams that triumphed in those two games (Pittsburgh & New Orleans) likely to win again this weekend. New quarterbacks will be on show for both the Redskins – who will start John Beck having benched Rex Grossman for this week’s game with the Panthers – and the Raiders, who lost Jason Campbell to injury last weekend and have traded two first-round picks for Carson Palmer – his first appearance will be against the Kansas City Chiefs. Tim Tebow will also be taking over as a starter for the Denver Broncos, and does so back in Florida, where he made his name in college, as his team travels to Miami to take on the Dolphins. had not even played a game. Just ask those who root for the Phillies, Red Sox, Heat or Eagles – all of whom were being predicted to go all the way prior to their respective seasons started, but failed to meet those expectations. So when I read in Peter King’s “Monday Morning Quarterback” column on SI.com this Monday that the Packers and Lions, should they both keep winning, would each be 10-0 going into their Thanksgiving day showdown in Detroit, I knew that Green Bay were cursed for this week’s game. Then I checked the fixtures for week 6 and saw the reigning Champs are home to the woeful St. Louis Rams and my fears dissipated. Having overcome an early deficit against the Falcons in Atlanta in last Sunday night’s game, the schedule has really opened up for Green Bay. Before the Turkey Day showdown with the Lions, the only other unbeaten team left in the NFL, the Packers face the struggling Vikings twice, host the Rams and the Buccaneers, and must travel to San Diego to play the Chargers – the only one of those games they will not be heavily favoured in. Since I’ve spent around 200 words jinxing my own team, time to move on to a recap of last week’s games. The Eagles dropped to 1-4 after their loss to the Buffalo Bills; the Vikings picked up their first win of the year by beating the Arizona Cardinals in Minnesota; and the Oakland Raiders, who lost their long time owner, Al Davis, who died on Saturday. The Tampa Bay Buccaneers were routed by the 49ers, who are looking strong favourites to win the NFC West this year; their divisional rivals, the Seattle Seahawks, provided the upset of the week when they beat the New York Giants in the New Meadowlands; and the Chargers survived a Tim Tebow fueled comeback from the Broncos in Denver, holding on to win 28-24. The Patriots got a measure of revenge on the Jets for last year’s playoff loss; the Steelers routed the Titans; and the Chiefs won in Indianapolis, dropping the Colts to 0-5. The pick of the games this week sees the Redskins, coming off a bye week, try to maintain their lead in the NFC East when they host the Eagles; Alex Smith and the 49ers travel to Detroit to face the 5-0 Lions; and the struggling Cowboys head to New England to play the Patriots. In the race for the worst record and therefore the number 1 draft pick, which this year mans landing superstar college Quarterback Andrew Luck, the 0-5 Colts are playing the Bengals; while the winless Dolphins, who had a bye last week, take on the New York Jets in New Jersey in Monday Night’s game. Last week in the NFL, the Cowboys gave away another late lead, to lose a game they had seemed destined to win. 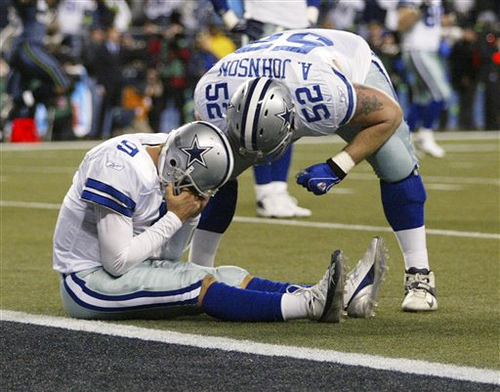 Having lost to the Jets in week 1 after a Romo fumble and a blocked punt, this time the Cowboys literally threw away a seventeen point lead, their quarterback throwing three interceptions – two of which were returned by the Lions for touchdowns. The Eagles also were victims of a comeback, losing to the San Francisco 49ers 24-23, dropping Philadelphia to 1-3 for the season. Elsewhere, the Patriots bounced back from their defeat to the Bills in Week 3 to beat the Raiders in Oakland; the Packers were powered by four throwing touchdowns from Rodgers, who added two more with his feet, in their 49-23 demolition of the Denver Broncos; the Ravens thrashed the Jets 34-17, in a game in which neither quarterback, Sanchez nor Flacco, distinguished themselves. The Giants and the Redskins both won, leaving the two tied atop the NFC East with records of 3-1; Washington beat the St. Louis Rams, who remain winless alongside the Minnesota Vikings, Miami Dolphins and Indianapolis Colts, who have still not been able to cope with the loss of their quarterback and leader, Peyton Manning. Week 5 is the first to include bye weeks, so this round gives a rest to Cleveland, Dallas, St. Louis, Miami, Washington and Baltimore. For teams that are playing, NFC North rivals the Bears and Lions play each other in Monday Night Football in Detroit; the Packers travel to Atlanta to face a Falcons team they defeated in the playoffs in convincing fashion last January; . In another rematch from January’s postseason, the Jets and Patriots meet up again in Boston, Tom Brady looking to gain revenge for New England’s defeat. Chiefs +2.5 over Colts – simply taking the points – Kansas City has looked much improved in the last two weeks, and Indy are still winless. Raiders +6.5 over Texans – Houston has not played particularly well thus far and yet are 3-1, meanwhile Oakland has lost to New England and a tough one in Buffalo, but I can see them at least covering this spread. Vikings -2.5 over Cardinals – because the coin came up tails – I could not pick between these two woeful teams. Saints -5.5 over Panthers – New Orleans has been quietly putting together good results since their opening day loss to the Packers. They’ll continue that run here. Giants -9.5 over Seahawks – I do not think the Giants can cover this spread, yet I do not think that Tavaris Jackson can keep Seattle this close…changed my mind several times but decided that the NFC West is so bad, I had to take New York. 49ers -1.5 over Buccaneers – because although I do not trust Alex Smith, despite him leading San Francisco to last week’s win over the Eagles, Tampa Bay played Monday night on the East Coast and have a short week before the West Coast game on Sunday. Patriots -9.5 over Jets – because Brady will be out for revenge, and will doubtlessly get it, as well as the Jets looking very ropey in their last two games. Packers -5.5 over Falcons – because Green Bay is the best team in the league, and I’m biased. Bears +5.5 over Lions – I think this will be a close game, so taking the points. 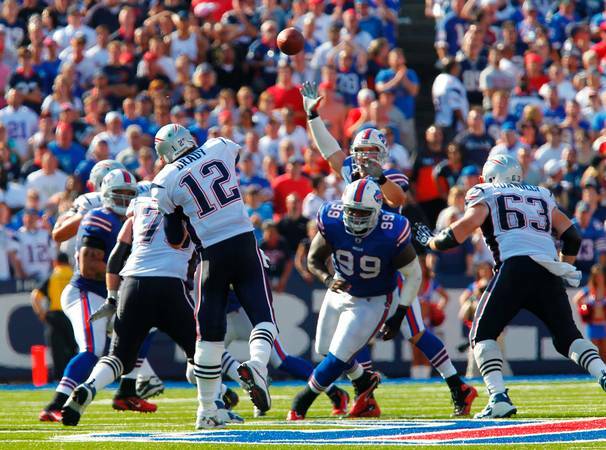 Last week in the NFL, the Buffalo Bills came from 21-0 down to beat the New England Patriots 34-31, securing a win over their divisional rival for the first time in 9 years. After their comeback the week before against the Raiders, the Bills are showing that they finally have a team that can compete with the best and have won all three of their games this season. The Detroit Lions also overcame a big halftime deficit to beat the Minnesota Vikings; the New Orleans Saints won a high-scoring contest 40-33 over the Houston Texans in the Superdome; the Colts put up a good fight against the Steelers, but succumbed to a late field goal; and the Packers beat their NFC North rivals, the Chicago Bears, 27-17. On Monday night, the Cowboys edged out the Redskins despite not scoring a touchdown, all of their points coming from field goals in an 18-16 victory. Going in to week four, three teams remain perfect – having won all of their games thus far: the aforementioned Bills, who this week travel to Cincinnati to play the Bengals; the Lions, who play the Cowboys in the Dallas; and the reigning champion Green Bay Packers, looking to improve to 4-0 at home against the Denver Broncos. Five winless teams remain, two of whom meet in Kansas City as the Chiefs play the Minnesota Vikings. 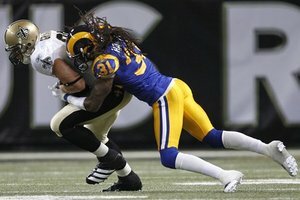 The St. Louis Rams take on the Washington Redskins, the Dolphins are in San Diego for a game with the Chargers, and the Indianapolis Colts play Monday Night Football for their game against Josh Freeman’s Buccaneers in Tampa Bay. In other games, the Patriots will look to rebound from their loss to the Bills in Oakland against the Raiders; the Giants and Cardinals face off in Arizona; and two of the AFC’s playoff teams from last year meet in Baltimore as the Ravens play the Jets. Although Week 2 in the NFL reinforced some of the lessons from the opening round of fixtures, some of the games showed that the season is still early and the shape of it is still to be determined. New England, Green Bay and the New York Jets have started strongly and have the look of dominant teams for this season; the Colts without Peyton Manning, the Chiefs and the Seattle Seahawks appear to be cannon fodder for their opponents. The Detroit Lions and Buffalo Bills, two franchises that have suffered barren years of late, are both 2-0 and are showing signs of promise for their fan-bases. 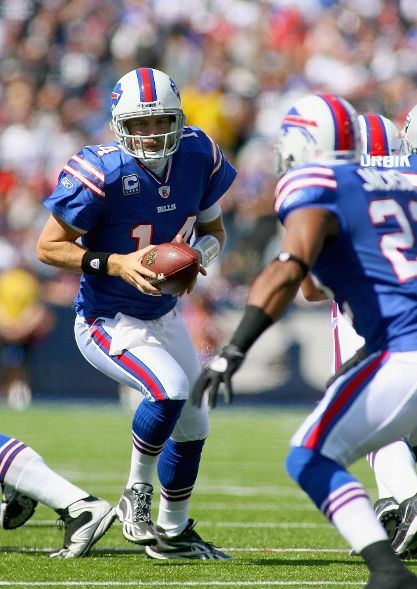 The Bills’ Quarterback, Ryan Fitzpatrick, led his team to 35 second half points, scoring a touchdown on every drive they had in the third and fourth quarters, for a dramatic last-minute win. However, their opponents, the Oakland Raiders, had played the late Monday game on the West Coast prior to this game on the East Coast at 1pm on Sunday, so this comeback may have had as much to do with their fatigue as the Bills resilience. The Ravens and the Cowboys had much different outcomes in their second games compared to their initial outings. Baltimore followed up their thrashing of the Steelers in Week 1 by themselves taking a beating from the Tennessee Titans; while Dallas QB Tony Romo, who had fumbled away a 14 point lead over the Jets in the opening fixture, was the hero this time around – throwing a 77 yard pass in Overtime to set up the winning field goal, despite having suffered a fractured rib on an earlier play. The Eagles and the Falcons are both 1-1 after Atlanta won on a night that their former Quarterback Michael Vick came back to face them for the first time as a starter for another team – though it took a concussion to Vick in the third quarter to swing the momentum in that game. 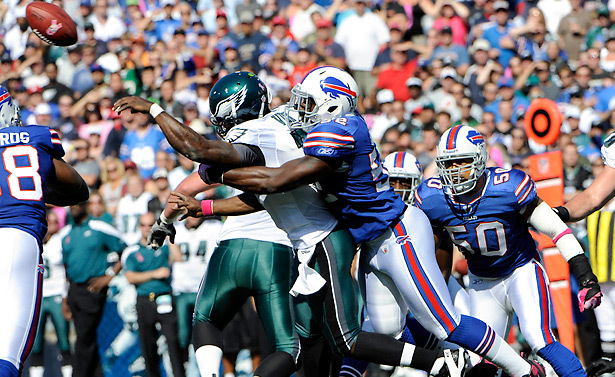 The Eagles are expecting Vick to return in time to face the New York Giants for their game in Philadelphia. Elsewhere this week, the Bills host the Patriots in a battle of 2-0 teams; the Bears and the Packers meet in a Chicago in a rematch of the NFC Championship game in January; the unbeaten Redskins face their divisional rivals, the Dallas Cowboys; and the Steelers get to beat the Indianapolis Colts.